The eventual arrival of towering screen presence Sean Connery as Dr. Henry Jones, Sr. alongside Harrison Ford as Dr. Henry Jones, Jr. allows for what may be adventure cinema's most potent pairing. 127 min. Paramount Pictures. Director: Steven Spielberg. Cast: Harrison Ford, Sean Connery, Denholm Elliott, River Phoenix, John Rhys Davies. 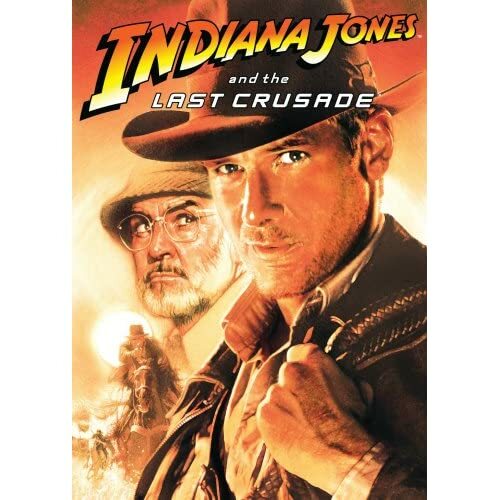 America's favorite fictional archaeologist got his first technical sequel in 1989: Indiana Jones and the Last Crusade. Set two years after the events of Raiders of the Lost Ark, Last Crusade cheerfully deepens the mythology of its hero in two significant ways: by introducing Jones as a teenage boy scout feeling his heroic oats and by introducing the "other" Dr. Jones, Indiana's father. The film's 1912 prologue, starring River Phoenix as "Young Indiana Jones," is a classic, brilliantly conceived as an exciting action sequence and a hugely satisfying (if a bit cutesy) distillation of the birth of a hero. And the eventual arrival of towering screen presence Sean Connery as Dr. Henry Jones, Sr. alongside Harrison Ford as Dr. Henry Jones, Jr. allows for what may be adventure cinema's most potent pairing (it's James Bond and Han Solo, for crying out loud!). A clever script by Jeffrey Boam (with an uncredited polish by Tom Stoppard and from a story by Lucas and Menno Meyjes) and perfectly modulated work by Ford and Connery deliver plenty of laughs and surprisingly credible father-son drama. The latter takes the emotionally-stunted pair to a profound destination at the end of a heroes' journey. The primary story—set in 1938—details the search for an ultimate lost prize: the Holy Grail. Indiana Jones follows the trail of his missing father, only to discover that once again, the Nazis are after the same ancient loot as the Jones boys. The rescue mission veers to an inevitable series of traps and puzzles between would-be Grail-robbers and the cup of Christ: will father and son prove worthy of the Grail and thus benefit from its staggering power? Does the Pope wear a pointy hat? The Last Crusade doesn't feel as "lived in" or as viscerally thrilling as the first film, but it's rollicking good fun that makes the most of its ample budget. A boat chase in Venice, a Nazi-book-burning rally, a ride on a Zeppelin, an aerial dogfight, and a showdown between a horse-riding Indy and a tank are among the film's many memorable sequences. The film also marks the welcome return of museum curator Marcus Brody (Denholm Elliott, promoted to comic sidekick status) and trustworthy aide Sallah (John Rhys-Davies). As Dr. Elsa Schneider—the cool blonde who makes eyes at both of the Jones boys—Allison Doody gets sold a bit short, but acquits herself nicely all the same; meanwhile, Julian Glover brings velvety menace to his duplicitous Nazi collaborator. The film's title, and a film-ending ride into the sunset, implied that "The Last Crusade" had a double meaning signifying the series' end. But after years of rumors and false starts over a nineteen-year-lag, the whip-cracking hero returns in Indiana Jones and the Kingdom of the Crystal Skull, a film poised to follow in The Last Crusade's path not only by continuing in the series' adventurous traditions but by further complicating Jones' personal life. For the first time on DVD, each of the Indiana Jones films gets an individual special edition, packaged together in the three-disc set Indiana Jones—The Adventure Collection. The Last Crusade disc kicks off with a Trailer for Indiana Jones and the Kingdom of the Crystal Skull (1:55). A familiar menu points the viewer to a fine anamorphic transfer of the film and a suite of brand-new extras, many of them featuring the cast of "Indy IV." "Indiana Jones and the Last Crusade: An Introduction" (6:14) is a concise an entertaining overview of the salient points about the prequel, with comments (filmed separately) by George Lucas and Steven Spielberg. "Indy's Women: The American Film Institute Tribute" (9:23) excerpts the 2003 onstage Q&A with Karen Allen, Kate Capshaw, and Alison Doody discussing their characters and feelings about the films, with a special guest appearance at the footage's close. "Indy's Friends and Enemies"(10:47) provides a too-swift overview of the women, villains, and sidekicks of the trilogy, with producer Frank Marshall, Lucas, Spielberg, screenwriter Lawrence Kasdan, and screenwriters Willard Huyck & Gloria Katz. The features are produced by the top talent in DVD extras: Laurent Bouzereau. Also included are "Storyboards: The Opening Sequence" (3:40)—which compares, in a top-bottom layout, the concept drawings to the finished sequence—and four Galleries: "Illustrations & Props," "Production Photographs & Portraits," "Effects/ILM," and "Marketing." Lastly, a test of your sense of humor: the Game Trailer (1:19) for Lego Indiana Jones: The Original Adventures. All site content © 2000-2019 Peter Canavese. Page generated at 04/17/2019 09:03:19PM.